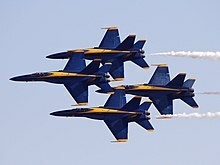 The Blue Angels F/A-18 Hornets flee in a ticht diamont formation, maintainin 18-inch weeng tip tae canopy separation. *Note – Anerly 7 F/A-18C/D Hornets are uised in a demo. 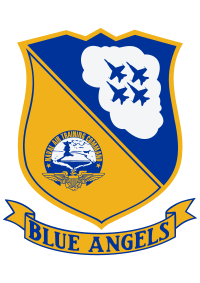 The Blue Angels is the Unitit States Navy's flicht demonstration squad, wi aviators frae the Navy an Marines. This page wis last eeditit on 6 Apryle 2018, at 01:11.